I expect you have been asked this many time but how did you become a bob sleigh pilot? I attended an open trial at Loughborough University having heard them advertising for youth athletes to join the Great Britain Team. I turned up in shorts a t-shirt and a pair of old trainers to see everyone else kitted up in their best spikes and Lycra. I then passed all the sprint, pushing and jumping tests they put everyone through and progressed to the next stage of tests in Bath. I impressed the coaches and became one of four boys selected to represent GB in the Omega Monobon World Series (1-man bobsleigh). Finish second in my first international race in Lillehammer, Norway is where my career kick started, I have then gone on to compete for Great Britain all over the globe including Canada, Austria, Germany and Switzerland to name a few. Adam started his sporting career as a karate athlete at the age of 4 and has amassed several British and English titles. In 2015 he made the switch to bobsleigh after attending an open trial at Loughborough University. 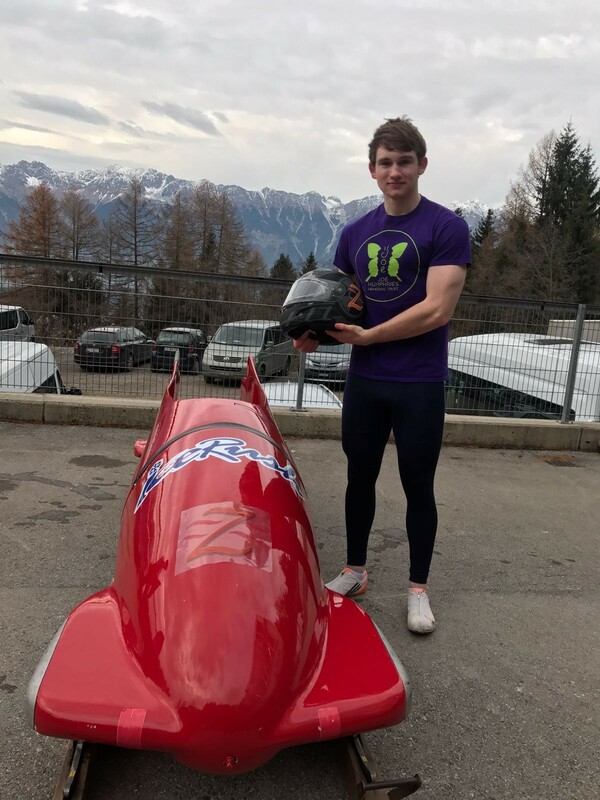 Adam now competes all over the world for Great Britain and was ranked 4th in World in the 1 man bob-sleigh at the end of the 2015/16 season. Adam is now 18 and part of the senior GB team and made his 2-man debut at the British Championships where he finished 6th last November. Adam has started his first year at the University of Bath and is also training hard towards the 2022 Winter Olympic Games in Beijing and the 2020 Olympic Games in Tokyo in hope to become the first British summer and winter Olympian. Go Adam! We have a feeling this guy won’t even have the time to waste his £££s in the student union. An average day for me consists of two training sessions, either a sprint, gym, swimming, karate or plyometric training. I’m currently still studying for my A-level exams and will be going to The University of Bath in September, so my training fits around my studies. As well as sport and school I also enjoy spending time with my family, friends and girlfriend. What races through your mind when you’re are on the start line for a big competition? Standing on the start line staring down the track in any competition is a nerve-racking feeling but the big competitions are completely different. I’m pretty good with handling adrenaline and nerves so most of the time the only thing going through my mind is being as aggressive and strong at the start during the push then as calm and collected to ensure I deliver a smooth fast drive down the track. It’s not a sport that you would expect the Brits to be any good at….are we? Yes, at all levels youth, junior and senior Britain are consistently a top 10 team at all major championships. The GB1 4-man team piloted by recently retired John Jackson finished 5th at the Sochi Olympics. How do you relax when you are not training or studying? Sport is a big part of who I am and what I’m about so if I’m not in the gym or at the track I enjoy playing other sports with friends such as football and badminton. I also enjoy spending time with my girlfriend who is incredibly supportive of my sport especially when it comes to going away for weeks on end competing abroad. Definitely the apricot flavour! I think FitBites are great as a pre work out snack to boost energy levels before a hard training session and that’s why I love them!